Today’s post is inspired by Skittles. Whenever I hear the phrase, “Taste the Rainbow,” I always think of Skittles. They were one of my favorite candies as a kid, especially the purple and red ones! They are both very colorful…and look like a rainbow! 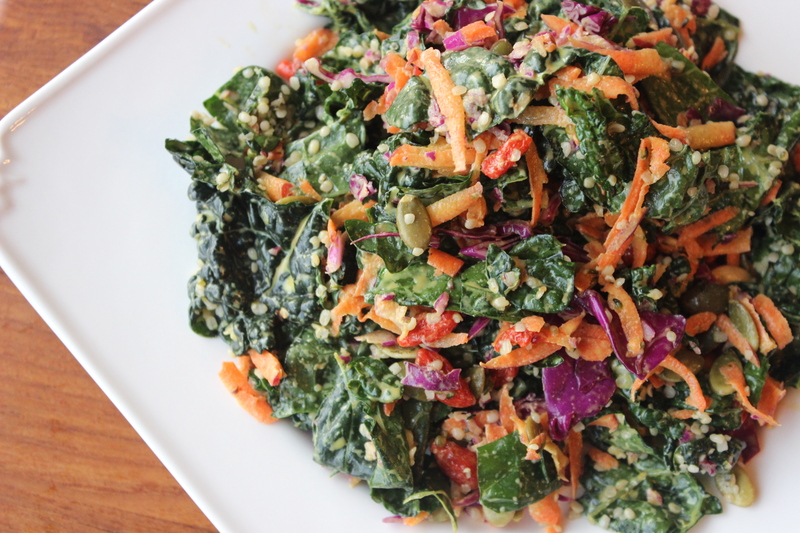 I taught a group of a dozen coworkers how to make this kale salad last week and they LOVED it! See what I mean?? You have to try this salad! So, what inspired this recipe? I’m currently going through a certification program to become a Culinary Nutrition Expert, and one of our assignments has been to focus on a particular health condition and come up with recipes and meal plans that would help someone with that issue. If you’ve ever had any kind of “itis” (dermatitis, laryngitis, bronchitis, colitis, rhinitis, gastritis, arthritis, thyroiditis, etc. ), you’ve dealt with inflammation. Our body is really smart, and it’s naturally designed to protect us from harm. At its most basic level, inflammation is the body’s response to an attack from a “foreign invader,” such as an injury, infection, bacteria, or virus. It’s designed to help us fight the bad guys, so we can stay healthy. We want our body to respond with inflammation temporarily when we do something like sprain our ankle or scrape our knee. Inflammation brings a rush of blood, nutrients and fighter white blood cells to the area to start the repair and healing process. For many of us though, inflammation is driven in part by the food we eat (and don’t eat). Most of the Standard American Diet (abbreviated SAD) is full of pro-inflammatory processed, refined foods loaded with chemicals most of us can’t pronounce and would be more likely to find in a lab than a farmer’s market. If we can reduce inflammation, we set ourselves up to be much better at preventing or delaying disease and even getting to a healthy weight. Dr. Mark Hyman has written extensively about inflammation and how to reduce it. Click here to learn more from him. The key dietary recommendation to heal or “cool” inflammation is to consume an unrefined, whole food (ideally organic), high fiber, plant-rich diet, which naturally stabilizes our blood sugar (and energy levels!) – another key to keeping inflammation at bay. 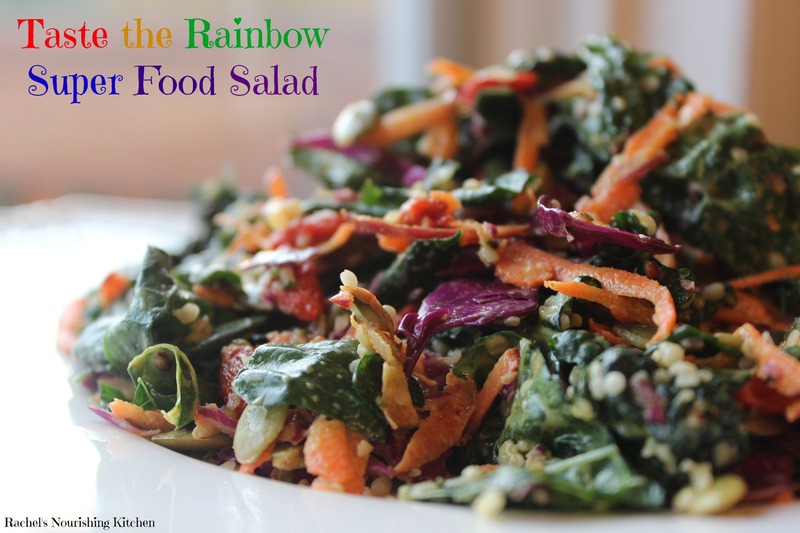 When I was creating this recipe, I focused on making it an anti-inflammatory powerhouse, something that your body would love for you to eat…and that would taste amazing. Crunchy, creamy, sweet, and the slightest bit salty, this salad has all of the flavors and textures we crave and love. The healing foods in this recipe contain anti-inflammatory compounds like antioxidants, polyphenols, and flavonoids that not only help us reduce inflammation but also boost our immune system, slow the aging process, sustain our energy, and regulate our weight. Here are just a few reasons why you’ll want to upgrade your diet and add in this super nourishing salad that’s loaded with immune, beauty and energy-boosting ingredients! Avocado, hemp seeds, tahini, pumpkin seeds, and extra virgin olive oil are excellent sources of anti-inflammatory fats that are not only good for our body but also for our brain (our brain is 60% fat!). The sulfur-containing compounds in garlic are also anti-inflammatory and immune-boosting. Leafy green vegetables like dino kale contain flavanoids and antioxidants that reduce inflammation in the body. Isothiocyanates (eye-so-thio-CYA-nates), sulfur-containing phytochemicals found in red cabbage, regulate the body’s inflammatory response. Turmeric contains over two dozen anti-inflammatory compounds, the most powerful of which is the antioxidant curcumin, which gives it its bright yellow color. 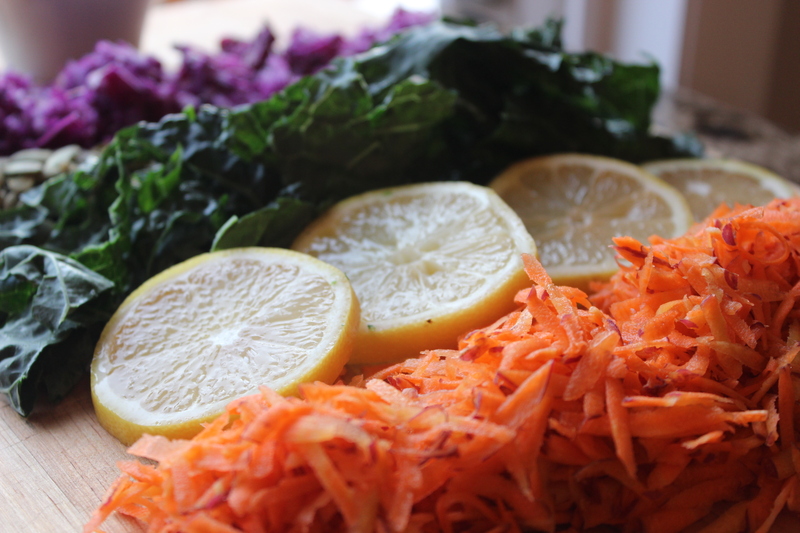 Ok, now that you’re super stoked about eating anti-inflammatory foods, here’s the recipe! Bring it to your next potluck or holiday party – it’ll be a hit! This is my #1 favorite salad of all time and is always a hit at parties and potlucks. 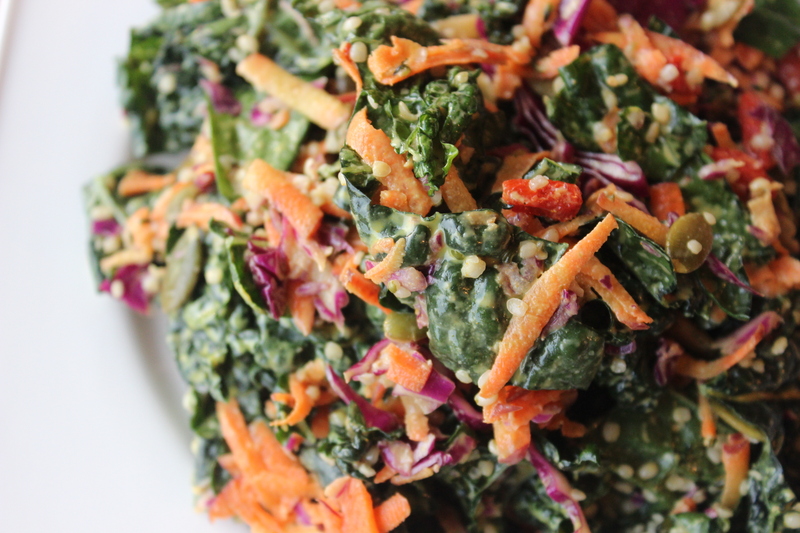 Packed with anti-inflammatory ingredients and full of flavor, this salad will turn any kale hater into a fan in no time! Whisk all dressing ingredients together in a bowl OR place them in a blender for 30 seconds until smooth. Taste and make adjustments to dressing, if necessary. Add a few tablespoons of filtered water to thin it out if needed. I like mine thick. 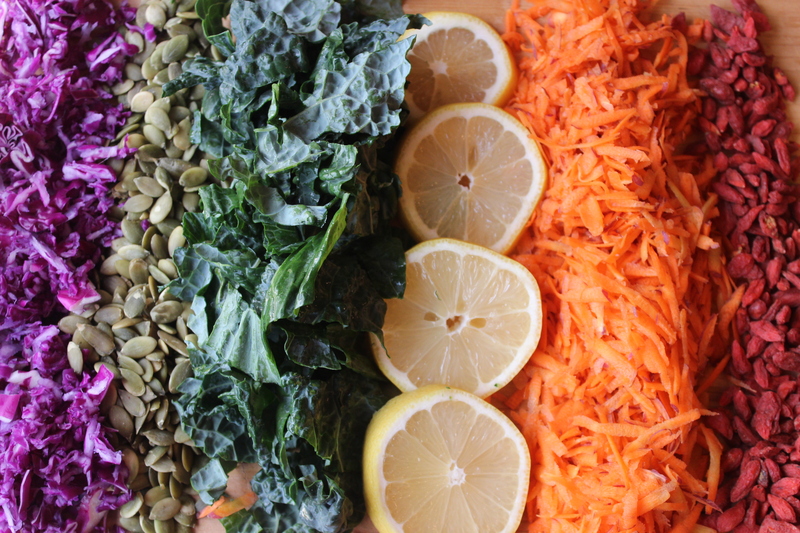 In a large bowl, place kale greens and add dressing. Massage dressing into kale leaves for about 2 minutes (until volume reduces by about 1/3). Add purple cabbage and toss to coat. Let sit for 15-30 minutes, so the dressing can continue breaking down the kale and cabbage. When ready to serve, add in shredded carrots, pumpkin seeds, avocado, hemp seeds, and goji berries (if using). Toss to combine. This salad will stay good for about two days in the refrigerator. 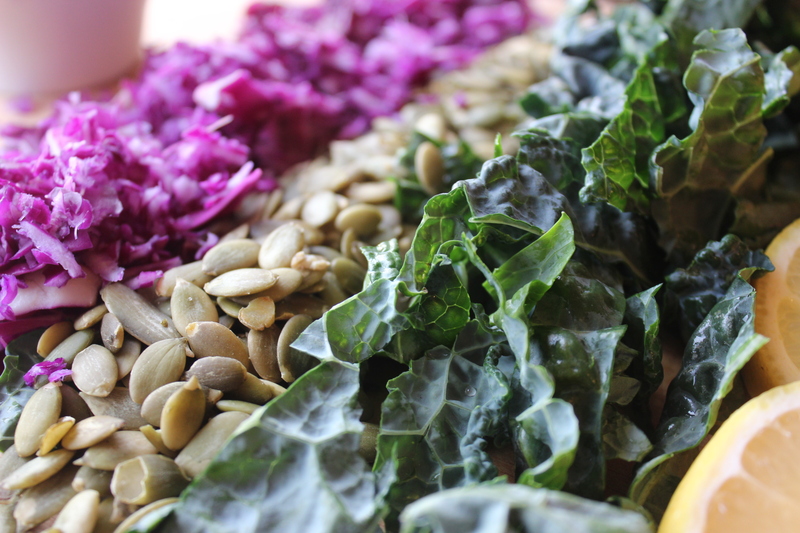 The heartiness of the kale greens prevents it from wilting like other salads would. Double this recipe if you’re bringing it to a party! You can add in any vegetables you like. Try this salad with some diced bell peppers, chopped broccoli, cooked sweet potato cubes or other vegetables. To make more of a complete meal, add in your favorite animal or plant-based proteins (chicken, salmon, lentils, beans, tempeh). Chickpeas or white cannellini beans would pair well with this salad. This looks delicious!! I love Dr Hyman, I have two of his books. It’s so true that you are what you eat. I’m not vegan but everything he says makes total sense. I just don’t have the willpower to give up chicken and pork and dairy. I do try to have several vegan meals throughout the week, though. I guess some is better than nothing. Thanks for the great recipe!! Hi Kayla! Thanks for your comments! Isn’t Dr. Hyman great? I really like him. I’m not vegan either – just dairy-free and gluten-free because that’s how my body feels best. I would say I eat a “plant”iful diet and high quality animal products when I do eat them 🙂 Let me know how you like this recipe if you end up trying it! Rachael – Thus sounds delicious but can you suggest an alternative to the tahini in the dressing? Thanks! Btw – Great workshop last night at the institute for integrative health! Hi there! I think we cleared up this question through Instagram but let me know if you have any other questions! 🙂 See you next week!